I am deep into recipe testing– I am hoping to test four recipes each of the next three days– whew! I hope my kids are hungry! I thought some of you might like trying this one. It is a good affordable meal for a winter day. Boil potatoes in salted water for about 15 minutes or until they are soft. Drain off water. Add sour cream, egg yolk and milk into potatoes while they’re still in the pot. Mash by hand or with an electric mixer until ingredients are blended and potatoes are mostly smooth. A few lumps are fine! While potatoes are boiling, preheat a large skillet over medium high heat. Cook hamburger til brown. Salt and pepper to taste. Add chopped carrot and onion to the meat, and cook for another 5 minutes, stirring frequently. Melt butter in a skillet over medium heat. Whisk in flour. Whisk in broth and Worcestershire sauce. Cook until mixture thickens. Add gravy to meat and vegetables. Stir in peas. Preheat oven broiler to high. Grease an 8 inch square casserole dish. Pour meat and vegetable mixture into the casserole dish. Spoon mashed potatoes evenly over the meat mixture. Sprinkle with paprika. Broil 6-8 inches from the heat until potatoes are evenly browned. Oh, YUM! This looks like it’d be easy to double (for our large family) or quadruple for freezing. I’ve been wanting a recipe for shepherd’s pie. Thanks!! 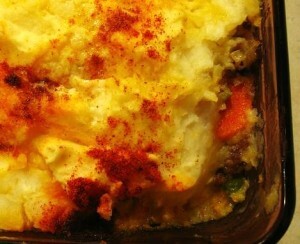 Mmm, we love shepard’s pie! My kids actually request this from time to time. 🙂 Your recipe is a bit different from mine so I’ll have to try it! Thank you!! I have been searching for a good shepherd’s pie recipe…this sounds excellent. I’ll be trying it very soon. Hey, Mary, that *sounds* good, but do we get pictures?? Please?? Have a good recipe for this already but always happy to give someone else’s ago because it may just taste better than mine. Keep posting recipes, always happy to give them a go, even here in New Zealand! Hi Mary, I don’t know if you can help me or not, but with 10 children you may have run across this problem. Our son, age 5 was neglected when he was an infant/toddler. He came to us at age 22 months. We are having a real struggle with him stealing. He steals food at home in the mid of the night, he steals class mates lunches and eats them at school and he lies constantly. We are at wits end. He claims stealing is fun and he likes it. That’s quite a different recipe than what I’m used to. We normally just use milk and butter to mash the potatoes. Jessica– That, in a nutshell, is why I am NOT a food photographer! Thank you! I’m looking forward to making this! The ingredients call for one egg, but the prep only mentions one egg yolk. Is the white being used somewhere else that I’m just overlooking, or am I just saving it for another recipe?